Windows users used to search; how to fix laptop screen flickering asap? How to solve laptop screen shaking? how to fix screen flickering windows 10?If you also getting the monitor flickering problem, then you're on the right page. The screen blinking is not a big issue at all. I have seen many users having the same computer screen blinking on and off problem these days. Even I got the mail saying his Dell Inspiron flickering screen after updating the OS. Particularly you HP laptop screen flickering on startup and then might get restarted. 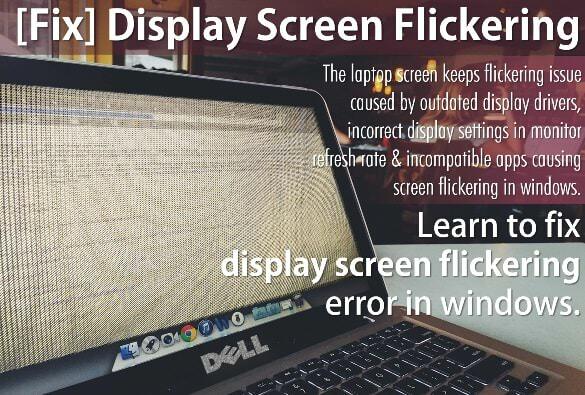 Fix Laptop Screen Flickering/Blinking - Don't worry, troubleshoot screen flickering in Windows is much easy and quick. It's has been proved that - the window flashing is not a problem neither with your updated operating system nor your CRT or LCD monitor hardware. After troubleshooting the laptop screen keeps flickering issue, it's seen that — outdated display drivers, incorrect display settings for monitor refresh rate & incompatible apps are the basic reasons for screen keeps flashing black windows 7 or screen flickering in windows 10. Not only in Windows, but MacBook Pro screen flicker problem also exists in some cases. Learn how to reduce, eliminate & fix laptop screen flickering, flashing, shaking error in simple steps. In the previous article, you have seen the same tutorial about How to fix display flickering error for Android phones and today we are going to see the same but laptop screen flickering issue in windows so the solution is also somewhat different than that of Android. One of the readers commented that "How to fix dell laptop screen flicker? My PC display flickering and blinking, it's very irritating". Check how to get rid of this on-screen display flickering error in windows. Initially, this error of screen blinking on and off was only limited to Android OS; but this screenflick error extends to Windows laptop screen — affecting our eyes terribly. You really need to focus on how to fix laptop screen flashing and repeatedly blinking, since it becomes difficult for the eyes to see & focus on the screen and that points to get eye strain & headaches; furthermore, this consistent blinking will cause the pupil to tighten and constrict, which results in a bigger eye range to focus [Vision Disorder] as you are spending lots of time in front of computer. Stop Desktop Monitor Blinking/Flashing ON-OFF: The issue is got to relate to the resolution, you need to change the frequency. Basically horizontal flickering lines when the screen flickers caused by vibrations on the screen and people started to believe that their computer system becomes OLD or electricity signal is not proper or graphics drivers are not updated. And I think, that might be true up to some extent, but those are not the practical reasons. Here you are not only remove screen flickering but also going to reduce background vibrations called screen shaking. Before starting to fix screen flickering error, make sure you are using the latest driver for the graphics card for your LCD monitor. Luckily, there are a few steps you need to follow to stop the screen flickering and to avoid these problems. Step 3. Open Display and click "Change display settings"
Step 5. Click on "Advanced settings" and small window pop out. Step 7. Now change "Screen refresh rate" to higher value. Set it as per your monitor settings to remove screen flicker. Step 8. Close all opened windows and check screen behavior, this should fix laptop screen keeps flickering error ever. Hope this solution has applied to fix your screen flickering error. If you know any better way to solve screen flickering, then you may share it via the comment section shown below. I would glad to add it directly to this page.